This beaded circle engraveable signet ring in 14K white gold from Apples of Gold Jewelry almost looks like a beautiful flower in full bloom! The lovely beaded design around the circle on the top of the ring adds plenty of character to the ring, which has a top dimension measurement of 11.5mm in size. This is the perfect size to select the optional engraving, which allows you to personalize the ring with one single initial or a three initial monogram. 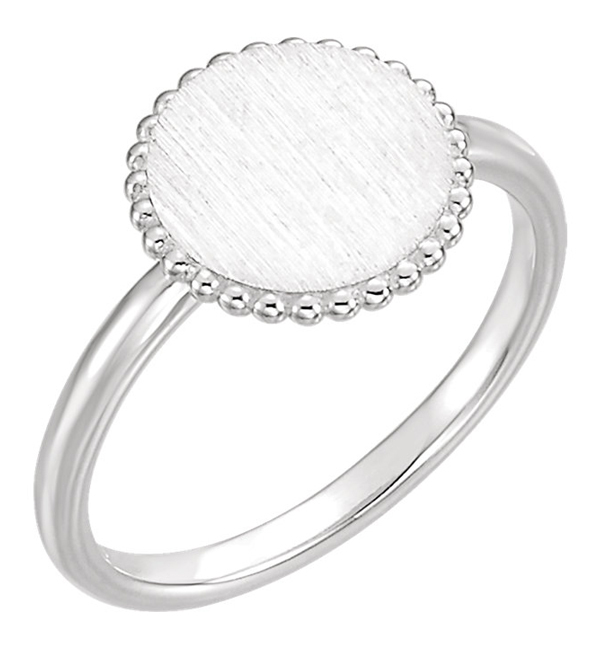 The band of the ring is a highly polished white gold, while the circle on the top of the ring is a satin brush finish. We guarantee our Beaded Circle Engraveable Signet Ring, 14K White Gold to be high quality, authentic jewelry, as described above.